Game Information: Since its release in 2010, Gonzo’s Quest has become one of Net Entertainment’s most played games at NetEnt online casinos. The Game presents strong and distinctive, cutting edge 3D graphics and a superb. Gonzo’s Quest is certainly one of the most original 5 reel video pokies that you will ever play. the theme, based on the Spanish conquistador exploration of the jungles of South America, will definitely satisfy you. The game’s 5 reels are unlike any other slots game, these don’t spin! Every time you click on the ‘spin’ button, 5 rows of stone blocks emblazoned with different symbols fall away, allowing another set of blocks to take its place. Truly an original approach! The game is visually very striking, with stone blocks occupying the 5 ‘reels’ and carved Aztec-style masks making up the game symbols. The masks are different in colour and include a red, yellow, green, purple, brown, turquoise and blue mask. Each represents a different value and the blue mask for instance offers the chance to win 2,500 coins if you manage to get 5 in a row (a payline). 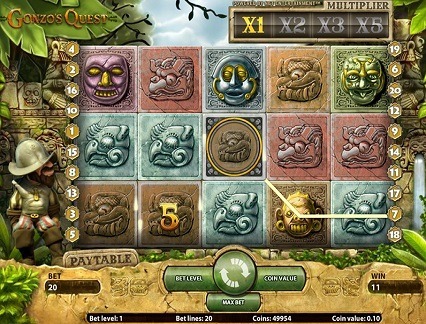 The Aztec masks emblazoned on the stones perfectly complements the falling action of the blocks as the reels are spun. The games scatter symbol, represented by the golden icon will trigger the bonus round if 3 or more appear across the reels at the same time. The bonus round, called the Free Fall Round, is essentially a free spins round (since the reels don’t spin but fall it seems appropriate). The Free Fall round also offers different multipliers including 3x, 6x, 9x and 15x for potentially massive winnings. Gonzo’s Quest also features a wild symbol, represented by the question mark on a grey stone. Like other slots games, the wild can be used to substitute other game symbols to make fast and easy winning combinations. Keep in mind that, when the wild symbol is part of a winning combo, it only pays out from left to right. The Avalanche Feature is very interesting and one of the reasons why this game is so popular. The Avalanche Feature allows players to take multiple wins from a single spin as winning payline combinations fall away to be replaced by new combinations. This occurs during a single spin and also includes additional multipliers, resulting in potentially huge wins with just a single wager. Gonzo’s Quest gets your attention from the very start with a cool and brilliantly animated introductory video which sets up the adventure perfectly. The 3D graphics are superb and it is easy to see why NetEnt is a leader in 3D animated slots design. The highly original design in the falling blocks instead of the usual spinning reels is another great design feature and one that is perfectly complimented by the games sound. The soundtrack consists of jungle sounds, mysterious animals and the sound of pan pipes and drums, perfect to put you in the mood for a quest for gold! While Gonzo’s Quest is not a progressive jackpot pokie it still offers a considerable fixed jackpot potential of as much as 187,500 coins or close to $94,000. The return to player on this game is around 96% and the game seems to neatly straddle the gap between a typically high volatility game and a low volatility game. This is because the game offers plenty of multipliers and bonus games on virtually every spin, leading to potential higher than average payout opportunities, while still offering a higher than average pay out frequency. Gonzo’s Quest offers great special features which include the Free Fall Feature which is this games version of a free spins round with 10 free spins that can be re triggered. The other special feature is the rather unique Avalanche bonus which offers potentially multiple wins off just a single spin (a single wager).